Here is a dish that I made up on my own. Whenever I make chicken soup, depending on how generous a bunch of dill I buy, there is usually a decent quantity that does not make it into pot. Hating to waste a fresh herb, I have made up some dishes to use the dill in. In looking at the ingredients in the list below, you will notice that the measurements are imprecise. How much you use depends on how many people you are serving and how much spaghetti you consider to be a normal portion size. This dish as described will serve two to three people. 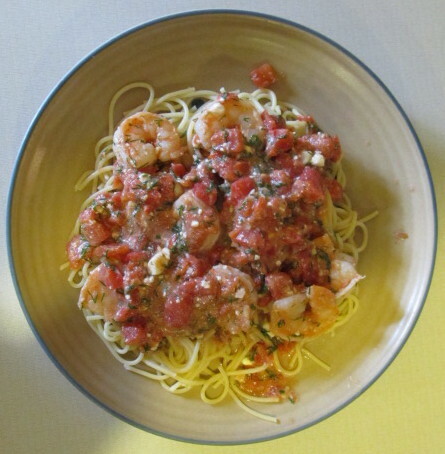 Personally, I use 1/3 pound of raw shrimp per person and 2.5 ounces of dry spaghetti per person. If I am serving more than 3 people, I up the other quantities as well but you should avoid that until you are comfortable making this dish. The cooking time for this dish is fairly quick so I like to prep all the ingredients in advance. Some of the prep can be done while the water for the spaghetti is being heated. Part of the timing of this dish is dependent on how long the spaghetti takes to cook and how tender you like your pasta. Peel and devein shrimp; remove tails. 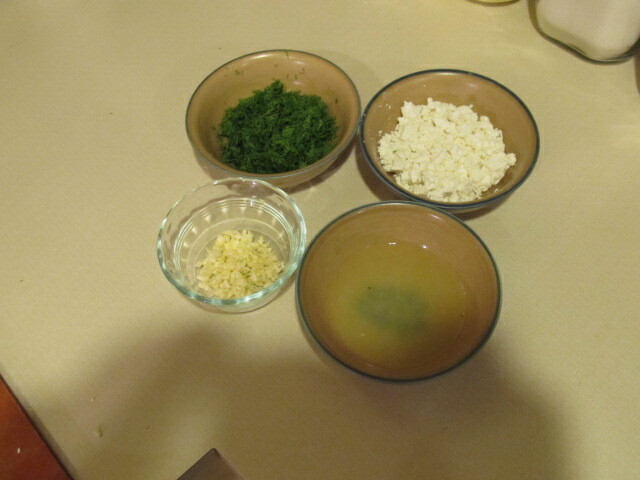 Remove dill from stems, chop up and set aside. Begin to heat the pot of water for the spaghetti. Strain the can of tomatoes and set aside to drain. If your pasta takes 8 minutes to cook, as the spaghetti water nears a boil, preheat olive oil in a 10 – 12 inch pan, preferably non-stick, using medium high heat. If the pasta takes 11 minutes to cook, wait until the spaghetti is in pot before preheating the skillet. You also must know your pan and your stove. If your pan heats up quickly, allow less time for this step. You do not want to burn the oil. When the water boils, add the pasta and set your timer . Place the shrimp evenly in the pan. Cook on one side for about 1.5 – 2 minutes depending on size. Turn and cook for another minute. Add lemon juice, tomatoes, and garlic. Stir. Check the pasta timer. Depending on the amount of time left, adjust heat on the shrimp pan. You want the contents of the pan to come to a simmer by the time there is one minute left on the timer. I recommend leaving the heat as is and then once you see the sauce beginning to simmer, then you can lower the heat. When the timer gets below on minute left stir in the dill. Drain the spaghetti when it is ready. Distribute to plates or place in a large pasta bowl if serving family style. Add feta to pan. Stir. Turn off heat and spoon shrimp and sauce over the pasta.